In Chicago, it’s a fleeting strawberry season. In fact, so quick that it’s only around for two weeks before the peaches move in and reign.Make strawberry syrup for a sweet treat without food dyes, or preservatives! And, without the mess of canning! This is the time of year when the berries have that full, sweet, “real” strawberry taste, and not that bland, disappointing, dense nothingness when they are out of season. Even though I’ve made freezer jam;I wanted to make strawberry syrup. My kids love that crappy, junky goop in a squeeze bottle that is stirred into milk and I wanted something natural that they could put in instead. I must admit, 2 tablespoons in milk is pure heaven. I love this syrup recipe. It can even be poured over ice cream, pancakes, almost anything, and I keep it in my deep freeze in little freezer-safe canning jars to have summer memories all through the dark winter months. 1- 1/4 to 1 1/2 cups sugar depending on how sweet the berries are. 1/4 teaspoon fresh squeezed lemon juice. Put the puree and the other ingredients in a sauce pan and cook it over low heat, stir until the sugar melts. Bring it up to a boil over medium-high heat. Once it comes to a boil, simmer over low for 5-7 minutes. I normally boil it until I can put a spoon in and when I pull it out, it coats with a thin layer. Skim the foam from the top. Save it though! You can still use it! This recipe made enough to fill 8 of those mini-canning jars. Let cool, pour in, put the lids on and keep in the freezer for up to 1 year or the fridge for 3 weeks. So easy! Take the left-over stuff you skimmed and give it a quick 30-40 second zap in the microwave, making sure it doesn’t boil over and let it cool before handling. The foam will settle and there will be much less to skim off and less syrup wasted. You’ll end up with almost one extra jar. Eat that one first, and then enjoy the fresh, sweet summer taste all year ’round. Need another way to use those extra strawberries? 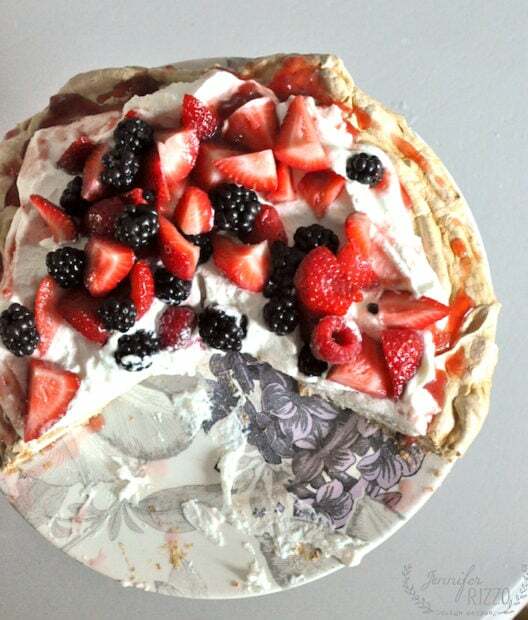 Make a berry Pavlova. Mmmm….sweet! Thank you for the recipe! I’ve finally posted more about the Farm Chicks show…including you! I hope you have a beautiful week. Sounds so good. I’d love to try this! that seems easy enough. and it looks delicious!! I love it that you said “real strawberry taste”. I agree with you. We had our first basket of Nova Scotia strawberries on Saturday. The first taste was like heavenly sunshine! Jen – your strawberries rock! Mine are so puny. I think next year, I’m going to plant a load of them in the garden. My raspberries are coming in too, but the birds are getting to them! Thank you for stopping by. I wanted everyone to leave with a chuckle in there heart. Your place is yummy!! I will take a couple of jars 🙂 Please! strawberry syrup in milk? who knew. & it does sound like heaven!! Jam and I do NOT get along despite the fact that I would love to be able to do it! I once drove 2 hours to buy 40 lbs of the ittiest bittiest grapes (remember I live in Arizona- things barely grow here) and picked them off the stems for hours to make my first batch. I skipped the candy thermometer because the store had it labeled as $20 – figured I’d wing it. I found out later it was their mistake and it only cost $2! My first batch turned out great- gave me great confidence to make the second. I made cute labels, handed them out to all my friends, only to find out MUCH later that I had given them grape hard candy in a jar, NOT jam! They were all too nice to tell me! It was only until I opened a jar from the second batch when my first ran out! I did try again with strawberries, to which my 12 year old nephew told me that he didn’t know what it was, but he sure liked my red goop! Oh these look fabulous !! I must try it! !